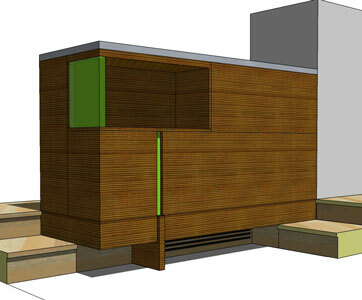 Cabinet designed for a gallery residence. Positioned between a main living /exhibit area and a kitchen area, the cabinet serves several functions. To the main room the design becomes a strong visual element that mirrors the owner's artistic interests. An offset lighted display area bordered by a translucent resin panel allows art display. 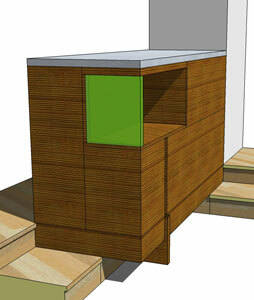 The kitchen side expands the storage needs with doors and drawers and incorporates a full depth wine cooler.